With a major opportunity on hand to help the breed, The Conservancy jumped into action on the recovery project and identified several members in the region who would commit to the recovery program and work with us to serve as new stewards for the breed. 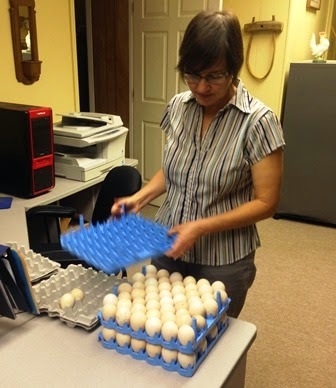 The first batches of hatching eggs arrived at the Conservancy’s office this past April and together with a nearby member, Julie Gauthier, we were able to hatch nearly 200 poults which were distributed to 4 farms in the region. This past week, we had an opportunity to receive 25 adult birds that were going to be replaced next breeding season with a younger generation of birds. 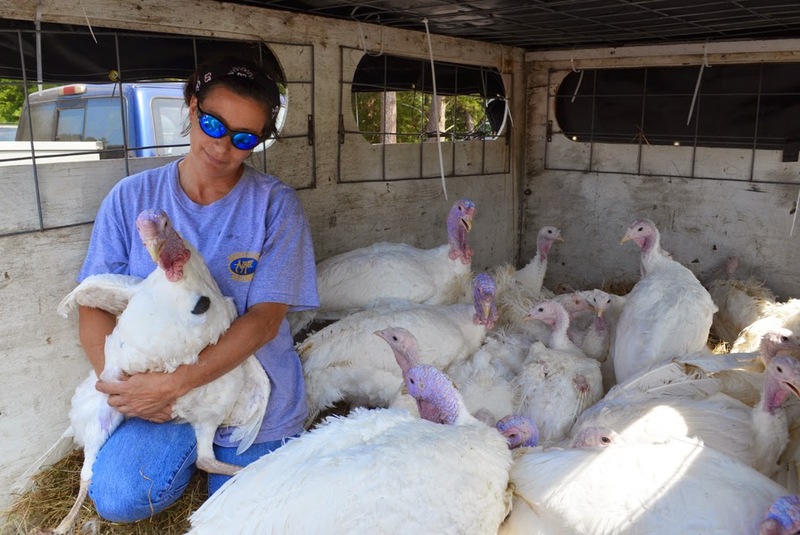 Staff member Jeannette Beranger and Conservancy member Julie Gauthier made the trek to Athens to collect 25 turkeys and bring them back to North Carolina where they will be incorporated into the breeding flocks started with poults from this spring’s hatch. This is a very exciting time for the Beltsville Small White and we hope to make them once again, a favorite for a smaller more intimate holiday table. For more information on the program contact Jeannette Beranger at jberanger@livestockconservancy.org. Reprinted from The Livestock Conservancy newsletter, Sept/Oct 2009. 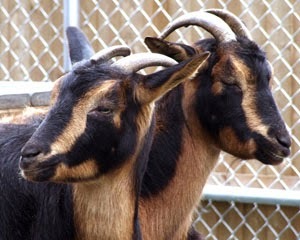 Leslie still breeds San Clemente Island and Spanish goats, and directs both breed associations. Last summer, I was sitting on my front porch, honored by the company of some real animal experts. As I am a ‘backyard’ goat breeder with only five acres, it didn’t take long before my small herd of San Clemente Island goats paraded by, the first few coming to check out the visitors, the rest just following the leaders of the herd. My senior buck passed by with a couple of does. Then along came my junior buck. It was only then that the Expert Goat Guy spoke up: “Nice buck,” he said. Sure, my junior buck, young as he is, is really flashy. “Yeah,” I replied, “but he’s as dumb as a box of rocks.” And this is where I met my crossroads. . . the goat guy said, “So?” As if animal intelligence didn’t really matter in the breeding business. It was then that I really understood the impact that an expert can have on a novice breeder. And it was also then that I understood the impact that a stubborn novice breeder can have on a breed. Believe it or not, both can be good. Spanish goats are a hardy breed that survived for 500 years without vets or shelter. Most of them still do. They used to be America’s meat goat until Boer goats arrived in the 1990’s and most ranchers ditched their Spanish to get Boers. Boers are very showy and muscle-bound. As a well-fed, show ring goat, a Boer can be bigger than life. Spanish have a more ‘rangy’ look. The sudden popularity of Boers is why Spanish almost went extinct. Most Boers are enormous. Most Spanish are not. It’s like comparing elephants to tigers. Interest in Spanish goats is increasing with the growth of the goat meat industry and with increased recognition of the breed's production qualities. 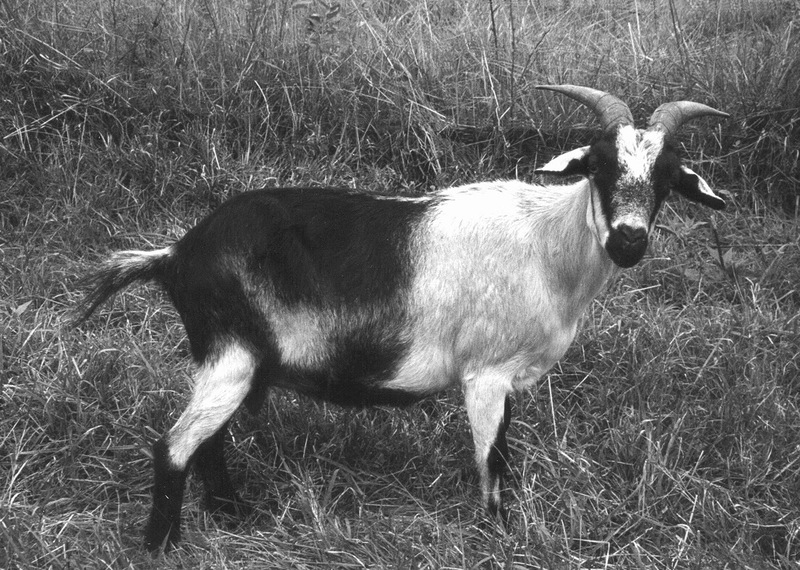 Spanish goats are hardy and rugged, thriving on rough forage and in difficult environments. Photo by Phil Sponenberg. However, it turns out that most Boers are fed a lot (hence the steroid look) and often need support to survive worms or raise kids. (Spanish have no trouble with these things.) Most Spanish are free-ranging, and therefore cheaper to keep and not as fat. Also, it seems that Spanish just hold muscle differently; just as heritage-breed chickens might look a little small but have a lot more to them than modern breeds. 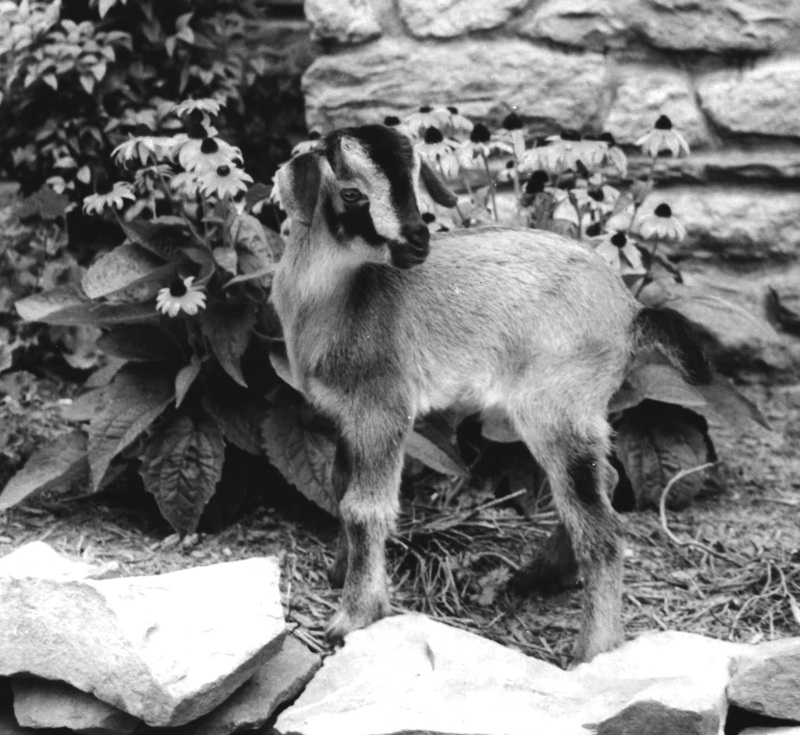 Dr. Richard Browning (Tennessee State University) recently confirmed what many have suspected for years: he found that if they’re raised on the basic farm forage, Spanish goats are meatier than Boers, but they just carry it differently. Spanish may look a bit rangy, but they’re meaty as heck. Raise them in the same field with the same food, and there’s more meat on a Spanish goat than on a Boer. But when similarly-raised goats are bought by slaughterhouses, they are still graded according to looks—Boer hefty-forefront wins, Spanish long-body loses. Beauty is in the eye of the beholder: slaughterhouses end up paying more for less, judged on looks alone. But from this small snippet of learning comes a more difficult challenge: ALBC (now The Livestock Conservancy!) wants to focus on Master Breeding, but what exactly should a Master Breeder be looking for? 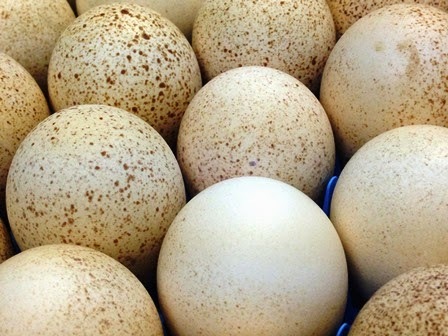 If a Master Breeder were to look for what end-buyers are currently looking for, we’d all have abandoned the heritage Spanish and we’d be stuck with the predominantly non-hardy modern alternative, with less meat for the money. Both buyers and Master Breeders use their eyes. How is it that they see so differently from each other? Let’s digress to San Clemente Island goats. Once again, we have a breed that survived alone without a vet or breeder for half a millennium or so. Stuck on an island with no water for a few months out of every year, the removed goats had the prickly-pear cactus scars to prove their desire to survive. With a new record mainland total of 400 goats globally (2009), and a portion of those in Canada with no hope of border-crossing, the ability of breeders to keep the genetic diversity going is pretty slim. But San Clemente Island goat breeders are meeting with success. 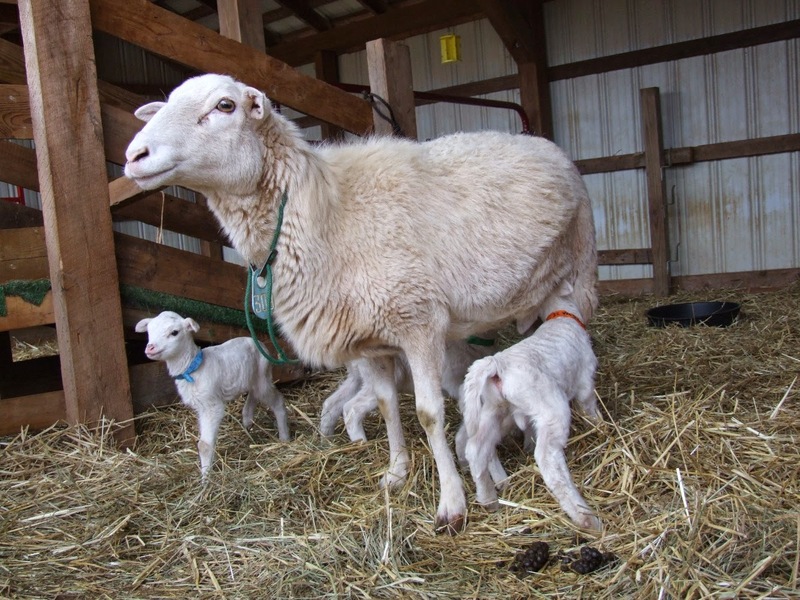 What do San Clemente Island goat breeders breed for? More than just survival, they do in fact breed for other things. Very diverse things. Some breeders focus on dairy abilities, some on meat potential, some on color, some on horns. Some breeders do not tolerate worms, some never heard of mineral salts in 20 years of breeding. Some will raise a weak kid in the kitchen, some will let a weak kid die in the field. The population is extremely limited, but with every new birth still comes the necessary and individual decision: keep, sell, or cull. Every San Clemente Island goat breeder is encouraged to set strong breeding goals and strategies, but every breeder must decide his own goals for himself. So far, the group is so eclectic that the mix strongly fosters genetic diversity. There are no Master Breeders for San Clemente Island goats; there are no ‘best’ herds. There is no ‘perfect’ San Clemente Island goat in any breeder’s eye that would necessarily appeal to the eye of another breeder. Yet they will survive. Spanish goats face some of the same type of variance, but there is a little less variance and much larger herds. Some breeders breed for cashmere, some breed it out. Some go for large size, some prefer a smaller goat for their particular range. Some like varied colors, some prefer uniformity. As Spanish goats became more rare in the 1990’s, breeders became more isolated, and we ended up with a variety of strains. Varied strains are a great thing. They are the genetically-diverse gene pool that we are conserving for our future needs. And we already need them. So where do Master Breeders fit into this? When you learn from a Master Breeder, be prepared to learn about soundness. You can learn about strengths that are particular to your heritage-breed animal, and how to spot an animal’s potential for weakness. Does a wide horn-spread indicate growth potential, or does a hen’s skin color indicate laying ability in your breed? Your Master Breeder can point out things that perhaps you hadn’t thought about. After all, they’ve known the breed for years. They understand the animals in question, and can see how your herd can reach its full potential. Although some Master Breeders are just ‘naturals’ who learned just from a few decades of close attention to their flock, more often they learned it from generations of raising one particular breed. Their selection strategies are not mainstream, they’re streamlined to your type of endangered livestock. However, your Master Breeder is not necessarily selecting for the same things that you are. If we all breed for the same traits, we will reduce the genetic diversity of our livestock. We would all end up with one strain, managed in the same way, bred for the same particular attributes. You can learn a lot from a Master Breeder, but it’s alright to walk away with many of your own and different goals intact. That’s what strains are all about. Genetic diversity relies on your ability to keep your great livestock going, and to go against fashion sometimes. Your Master Breeders did that: that’s why they maintained a heritage breed in the first place. They want you to learn, but they want you to learn as an individual breeder seeking new skills, not as a follower of fashion. Form your own breeding objectives, communicate your needs, and a truly great breeder will help you accomplish your conservation goals. So what if my junior buck is as dumb as a box of rocks? When I turn on my truck's ignition, my goats have three seconds to get out of the way with babies intact. Any goat not answering to its name does not get checked regularly for worms. Every goat has to learn about toxic plants the hard way. And unless a buck is quick-witted, he'll never get past my clever senior buck to get the opportunity to breed. “So?” So maybe the Goat Expert recognized that. If my junior buck doesn’t live up to my particular breeding program, he’ll probably cull himself. My methods and objectives may not be popular, but that’s just the way we breed them here. And my herd will survive. Many thanks to Dr. Richard Browning, who has contributed greatly to the renewed popularity and conservation of Spanish goats just by focusing research efforts on the comparative performance of different goat breeds. For more information about Spanish goats, contact: Spanish Goat Association, 3037 Halfway Rd, The Plains, VA 20198, spanishbreeders@gmail.com, www.spanishgoats.org. For more information about San Clemente Island goats, contact: San Clemente Island Goat Association, 3037 Halfway Rd, The Plains, VA 20198, scigoats@gmail.com, www.scigoats.org. Every San Clemente Island goat breeder is encouraged to set strong breeding goals and strategies, but every breeder must decide on their own goals - based on education, sound breeding practices, and advice from others in the field. Photo by Leslie Edmundson of a young San Clemente buckling. Love this blog post by Jeremy Engh, a master level breeder of Devon cattle. It's titled "Legs and Feet", and here's a picture of his bull stud. Jeremy raises 100% grassfed and grass finished cattle in Virginia. (1) Are there heritage pig breeds that are regarded as producing exceptional meat? 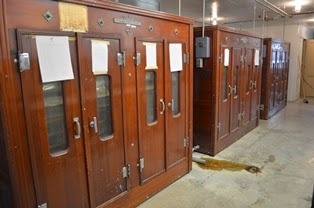 (2) Are the breeds listed on the Conservation Priority List the only breeds that are considered "heritage"? I keep bumping into farmers who say that their Duroc or their Kurobuta pork is a heritage breed. And I notice that Heritage Foods USA lists Berkshires in their pork product offerings. With the pork, the first big dividing line in flavor is confined and grain fed vs. pastured. The second dividing line is fatter vs. leaner. The breeds on our list are old fashioned and have more lard and marbling than the modern breeds. They’re also slower growing. Slower growing, pasture raised pigs are more flavorful, and that difference is especially noticable in the fat. Studies have also shown the meat and fat of pasture raised pigs to be more healthy, with higher levels of vitamins and heart healthy fatty acids. There are differences between breeds, and once upon a time breeds were known as bacon breeds vs. lard breeds. The long, lean breeds were bacon breeds. 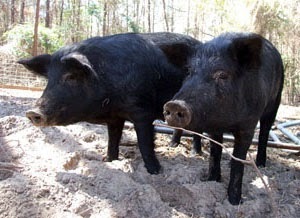 The bacon breeds have fat, but are thinly muscled (Ironically, today’s Berkshire is long and lean, but in the early 20th century it was known as a lard breed. Look at the old pictures, it is quite a change!). 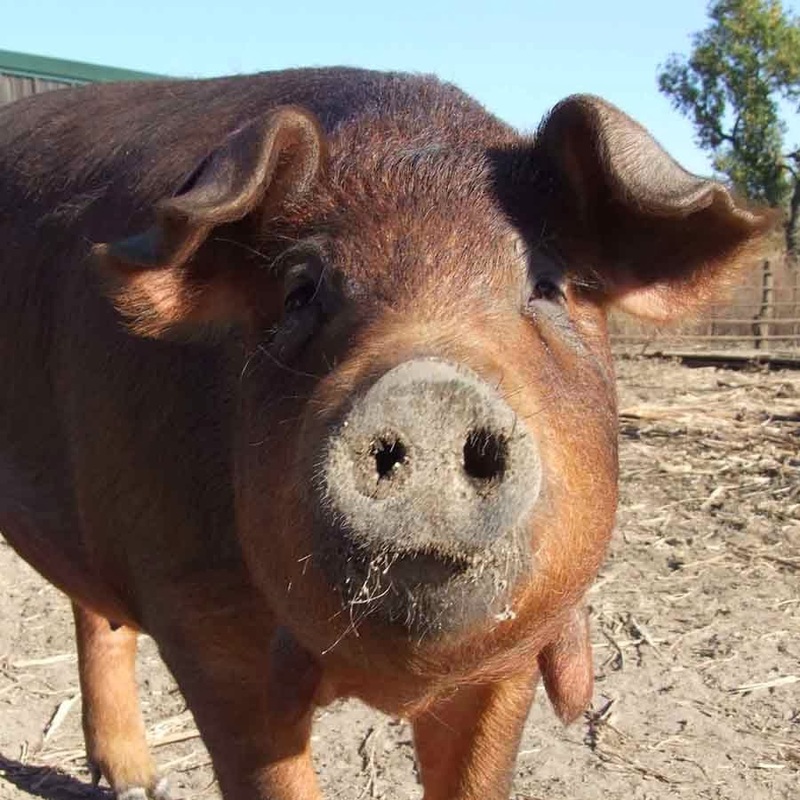 Of the breeds on our list, in general, Red Wattle and Tamworth are leaner, with Tamworth well deserving of its reputation as a bacon pig (yum). 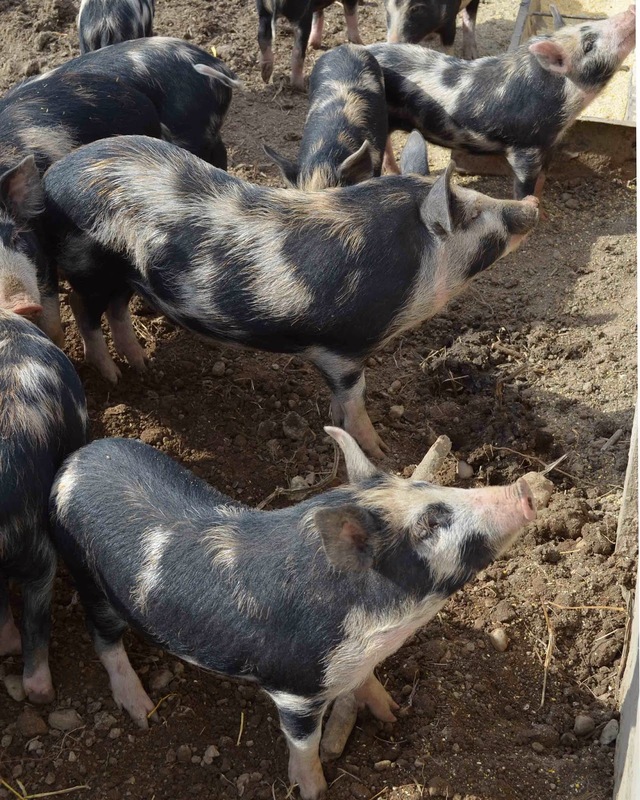 Large Black and Gloucestershire Old Spots are also considered bacon pigs, but have more lard than American consumers are accustomed to (also delicious). Mulefoot and Ossabaws can go either way, it depends a lot on management. If not managed properly, they can gain too quickly and get fat. Guinea Hogs are very much a lard breed, with abundant and firm lard that is perfect for charcuterie. Herefords are similar in conformation to modern breeds, and have good sized hams. “Homegrown Pork” by Sue Weaver. “Lard” by the Editors of Grit Magazine. The recipes are guaranteed to make you smile!